Came across this, sounds exciting! "The folks over at Chronicle Collectibles have announced another new license. They will be producing collectibles and figures based on Arnold Schwarzenegger’s 1982 cult favorite; Conan The Barbarian. The first item announced is a King Conan 1/4 Scale Figure for the fourth quarter of 2015. They will also have several other figures in the future." Here's a little more info from a Chronicle post on the sideshowcollectors.com forum. Hopefully we'll have some photos after SDCC! "Thank you guys, we've actually had this license for almost a year, so it's not something we went after recently. 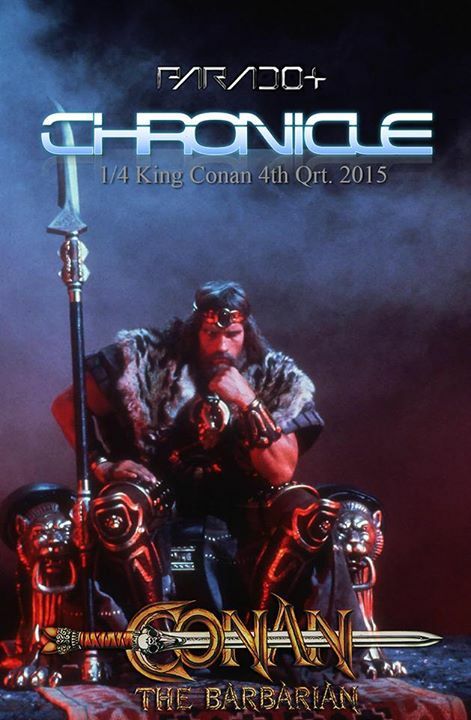 We have 1/4 King Conan on the Throne, 1/6th Movie Poster recreation and 1/4 Thulsa doom. If King Conan performs well we can do 1/2 and 1-1 busts and props. While doing Terminator Genisys the production gave us the CGI files for 1984 Arnold, what do you do with 84 Arnold? What don't you do with 84 Arnold? We'll be using these files to create our Conan products for ultimate accuracy. If you've seen our 1/4 Genisys Arnold you know how accurate it really is. Arnold approved it with zero changes which is a first on the history of Arnold products ..... His Handlers told us it's the best likeness from the terminator franchise..."
If you visit Chronicle Collectible's Facebook page, you'll see pics of some more of their upcoming Conan stuff from this year's SDCC.